Made from 100% recycled paper and contains no dyes, which saves natural resources. 1 huge roll, 240 segments, 2 ply paper. Free from dyes & fragrances. 'Renova Green Gigaroll' material had a previous life and believes in reincarnation. This treeless paper is the result of urban forestry, collecting waste paper and turning it into something new, clean and reusable. Buying this product will earn 30 Loyalty Points. 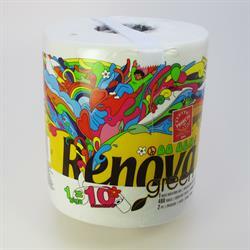 Be the first to submit a review for the Recycled Paper Towels.